Ferrari James, under jockey Oscar Delgado, winning the Iowa Double Gold Derby Saturday at Prairie Meadows. ALTOONA, IA�SEPTEMBER 3, 2016�Fastest qualifier Ferrari James defeated multiple stakes winner The Fiscal Cliff by a neck in the $84,149 Iowa Double Gold Derby Saturday at Prairie Meadows. The pair ran 1-2 in the August 20th trials and came into the race as the top choices. Ridden by jockey Oscar Delgado, Ferrari James rallied to overtake post time favorite The Fiscal Cliff at the wire. The Ivory James gelding completed the 400 yards in :19.992 seconds, into a 10 mph headwind. 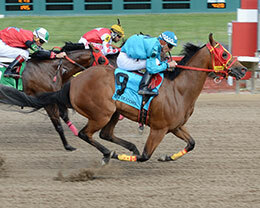 It was the sixth win in 11 starts for the Alfredo Botello owned 3-year-old. The $30,722 winners' purse boosted his career earnings to over $104,000. Weetona Stanley and W.E. Smith bred the bay gelding from the Mr Jess Perry mare Ferarri Fast Prize. The Fiscal Cliff races for owner/breeder Tom Lepic and trainer Shawna Manriquez. Ridden by Cesar Gomez, the bay colt picked up $18,280 to push his earnings total over $250,000. Joel Rod Pierce's Prized Wagon finished a neck back in the blanket finish to take third. Gina Downing trains the colt. Ridden by Esqueda, Prized Wagon earned $7,682. Bred by Robert and Karen Nunnally, the multiple stakes placed colt has earned over $165,000. There Goes My Wallet, Okeyfreight, Freighttrain V, Divas Candy Girl and Candys Lil Wagon completed the field. D D Chicks Piloto and Kokko Wagon were scratched.